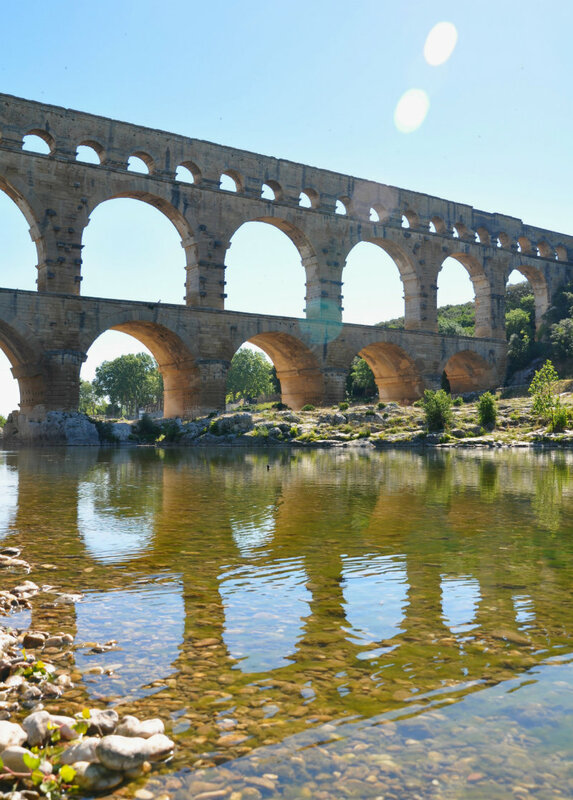 Deftly straddling the Gardon River, the Pont du Gard is an aqueduct that was built by Romans in the first century. The three-tiered, arched bridge dates back some 2,000 years and was created to carry water from the source in Uzès to the cosmopolitan town of Nîmes, where it was used for decorative fountains, home sanitation and in the city’s public baths. The famous bridge, now a UNESCO world heritage site, is located about halfway between Nîmes and Avignon, with each about a thirty minute drive away. It’s part of a 50km aqueduct system, but this section is notable for being the highest of all elevated Roman aqueducts at 160ft. 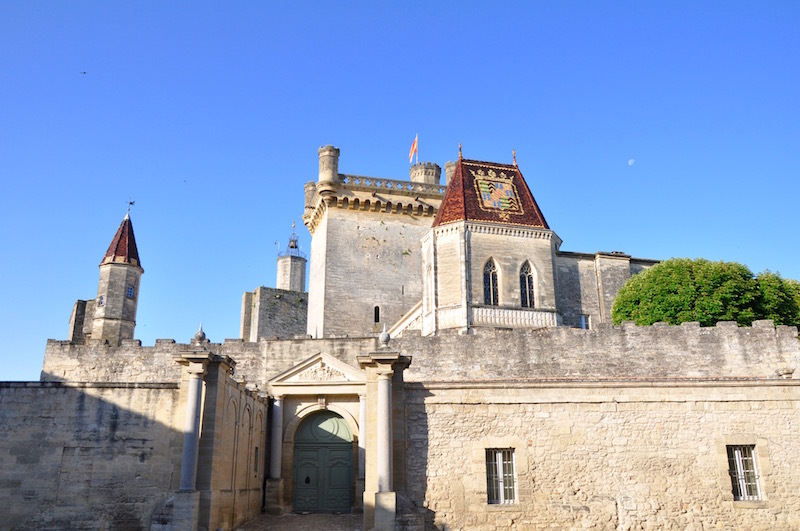 The site is home to a museum and visitor centre that welcomes around 1.4 million visitors each year, making it one of the most popular – yet little-known – attractions in France. I arrived at around 8am on a Friday, well before the official museum opening time (9am), so that I could get photos of the bridge without the crowds. The sun was already hot and there were a few people milling around, walking dogs or taking in the spectacular scenery. I certainly wasn’t the first one there. I started by walking down the little gravel, tree-lined path to the Pont du Gard, and it was every bit as spectacular as I had imagined. I’d be impressed if the bridge had been built yesterday, but the fact that it was completed around 2,000 years ago is almost beyond belief. You can cross the bridge along a walkway just above the first arches, but you otherwise can’t climb on the structure or cross at higher points, for safety and preservation reasons. But even though the structure is amazing, the scenery is what makes a visit to this site absolutely jaw-dropping. The river meanders lazily past lush greenery and pebbly patches perfect for sunbathing, and even with loads of visitors you can still find a quiet spot to sit and reflect in peace. 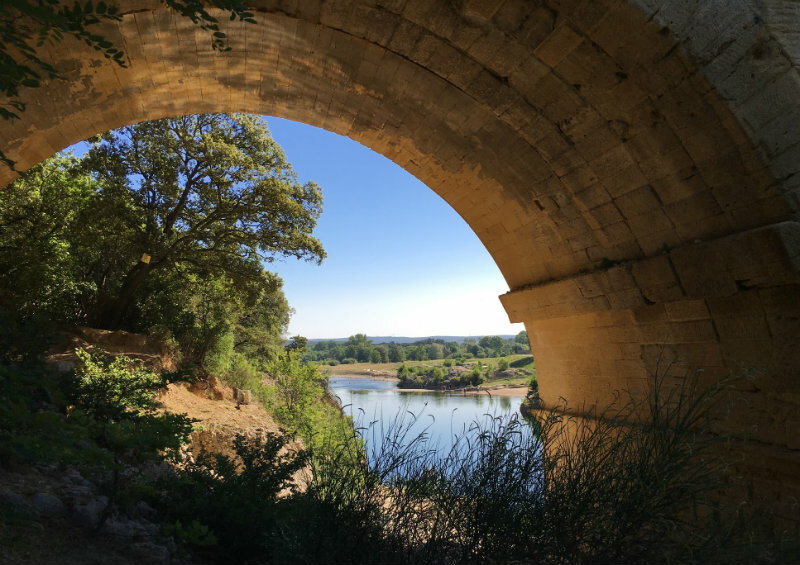 The great thing about the site around Pont du Gard is that you can walk around, either up the hill to see the arches from above, or down the banks of the river to paddle your feet and gaze up at 160 feet of pale golden limestone. Once I’d inspected the bridge from a few different angles, I walked back up the path to the visitor’s centre to check out the museum. It’s fascinating to learn more about how the aqueduct was built and how the water was used when it arrived in Nîmes, so don’t miss spending some time in this cool, dimly lit museum (which also happens to be a good respite from the heat outside if you’re visiting in the summer months). As well as the museum, there are a number of cafes and shops to keep you refreshed during you visit. It costs €18 to visit the site by car – this fee includes parking and entry to the museum for everyone in the car (so it’s more economical to visit as a group). You receive a ticket when you enter the site and you need to pay at a machine in the visitor centre so you can exit the car park area again – kinda like a car park. 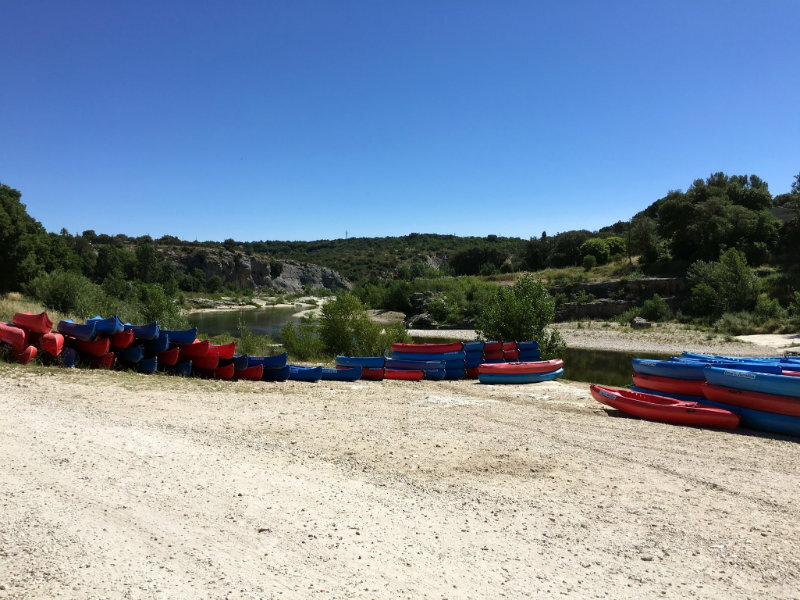 If you’re more adventurous, or you’d like to see the Pont du Gard from a new perspective, drive a few minutes down the road to Canoë Le Tourbillon, a canoeing company that’s been around since the mid-80s. At the friendly welcome area you’ll find changing rooms (definitely wear swimming gear and stuff you don’t mind getting wet…but be sure to cover up as much as possible so you don’t get burnt), a kids’ play area and a little cafe where you can buy drinks and snacks for your trip. Top tip: pack lunch to bring along…you can stop on the way to eat a delicious French picnic! You’ll set off in a canoe with a waterproof bucket that you can put your belongings into, and then you simply paddle down the river for a couple of hours. It’s not a guided trip…you are literally given a canoe and told to paddle downstream till you come across a red canoe in a tree, which is the pick-up point. 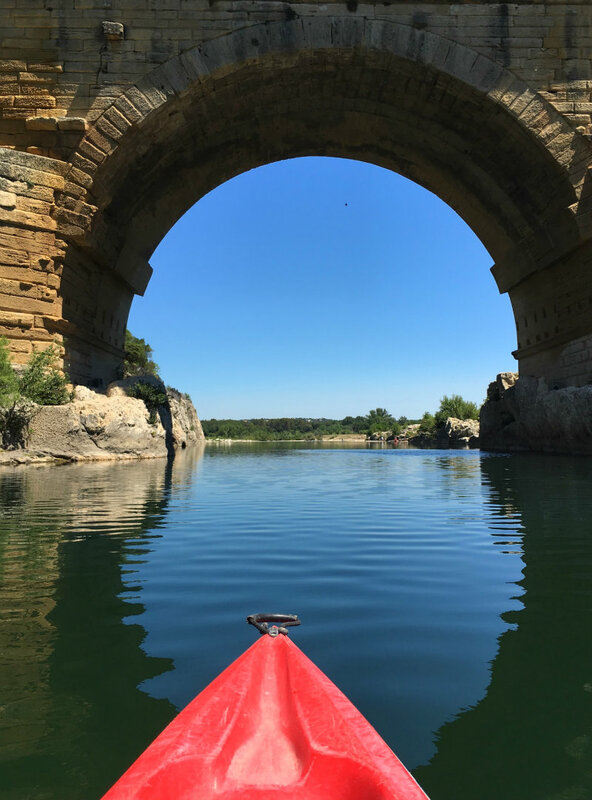 This trip, which takes you right under the Pont du Gard, takes around 2 hours, although you can arrange to be picked up later (all pick-ups are on the hour) if you’d prefer to stop for a swim or paddle at a leisurely pace. Paddling along without a guide is a bit disconcerting first, but a few minutes in I was open-mouthed at the incredible scenery I was surrounded by, and I totally forgot I was all alone on a river, a long way from home. There weren’t many people around, so I could enjoy the clear, glassy water, verdant banks and warm sunshine, the only interruption being the odd fellow paddler or a dog fetching a stick thrown by its owner on the banks. 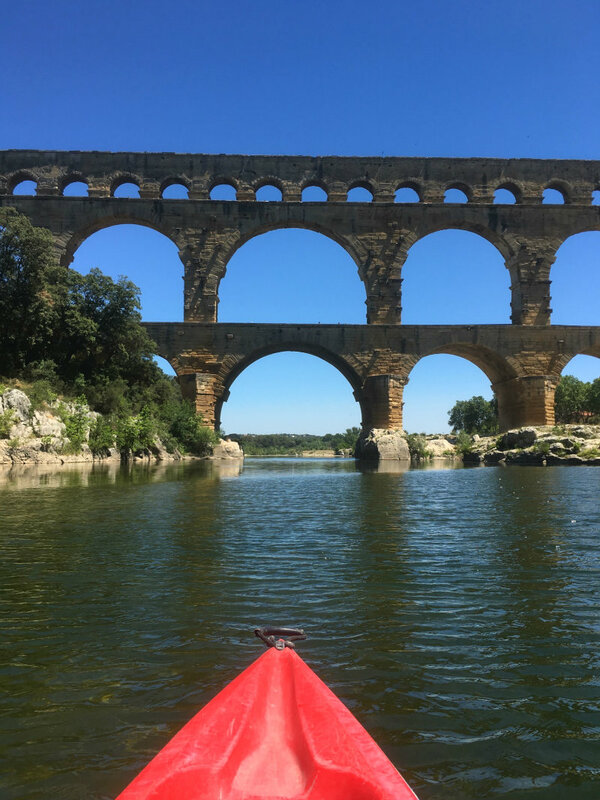 I expected the highlight to be passing under the Pont du Gard, but while this was spectacular, it was the peaceful moments where it was just me and a couple of dragonflies in total solitude that really made the canoe journey memorable. There were a few faster-flowing sections, but it would be an overstatement to call these bits rapids, so the trip is suitable for anyone comfortable on a canoe. Amazing photos and in south France has everything own charm. A Mini Guide to Mont Saint Michel: A real-life Harry Potter town!